We are closely watching several types of districts in the race for control of the House of Representatives. 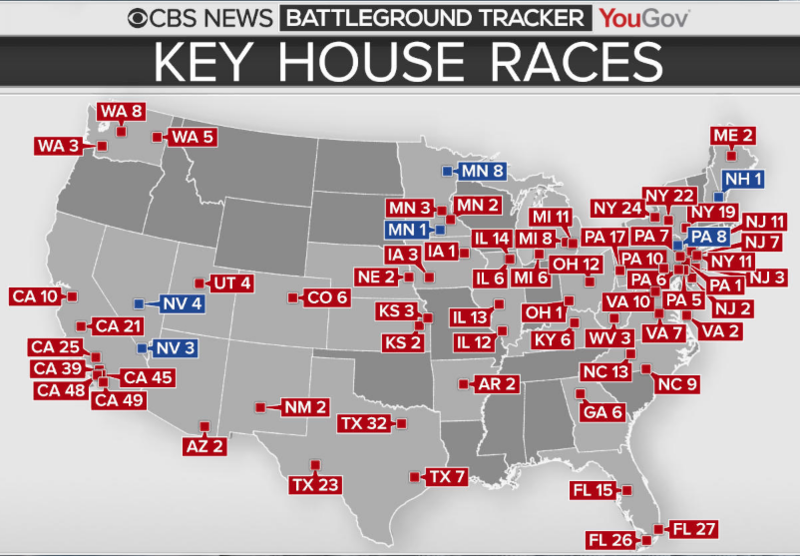 We have identified competitive House races from coast to coast, as part of the CBS News/YouGov 2018 Battleground Tracker, which polls voters across the country and then applies a statistical model to rate each congressional race and estimate how many seats each party is favored to win. We have organized these districts into groups based on their demographic profiles, voting history, and chances of flipping. With less than a week to go until Election Day, here are the groups of districts we are watching, as well as a couple of illustrative races in each group. This large group of affluent, suburban districts is crucial for the Democrats to retake the House. While these districts all elected Republicans to the House in 2016, they mostly cast presidential votes for Hillary Clinton (her average vote share: 51 percent). On average, 46 percent of residents are college educated, a group breaking heavily towards Democrats this year. According to our model, most scenarios in which Democrats take the House also have them winning several of these races. CO 6: Republicans believe that some strong incumbents like GOP Rep. Mike Coffman can push through national headwinds, having experienced tough elections before and maintaining an image above partisan politics in their districts. However, Coffman is running against a well-funded challenger, Jason Crow, in an Aurora-based district that Hillary Clinton carried by 10 points. It is looking like a pretty tough storm for Republicans to weather here. GA 6: Republicans proved that they could hold one of the most highly educated districts in the country when Karen Handel won last year's House special election in Georgia's 6th congressional district. Republicans need to prove they can continue to hold such seats two years into Donald Trump's presidency, and this time, when the race is no longer the center of national attention. Donald Trump carried these mostly white, working-class districts in 2016, often by large margins (his average vote share: 58 percent). Democrats have made inroads in these types of districts in recent special elections, buoying their hopes of flipping some this year (though they only outright won a single House special, in Pennsylvania). While Republicans are favored in most of these races, some of them look like complete toss-ups. IA 1: While white, working-class voters flocked to Trump in 2016, Democrats believe the right candidate can win them back. Barack Obama carried Iowa's 1st Congressional District in 2012, but the district then flipped to Trump. State Rep. Abby Finkenauer, the daughter of a pipefitter welder, thinks her local roots and support from labor groups will help her defeat incumbent Rod Blum. Indeed, this race is the most likely to flip from Republican to Democratic among this group. KS 2: Sam Brownback is not governor anymore, but he has left a legacy that has turned into a bit of a headache for Kansas Republicans. Democrat Paul Davis has carried the 2nd district previously (when he lost the 2014 gubernatorial race). He is now running for Rep. Lynn Jenkins' newly open seat against Republican Steve Watkins, who keeps landing in hot water in the press. These are places with large minority populations, particularly Latinos (who make up an average of 47 percent of district residents). Most are majority-minority districts that Hillary Clinton carried. The big question is whether Latinos and other nonwhite voters defy historical midterm patterns and turn out in large enough numbers to flip these seats from red to blue. CA 21: Despite the fact that he is running as a Democrat in a majority-minority congressional district that Hillary Clinton carried, T.J. Cox is the underdog in his race against Republican Rep. David Valadao. Cox has run as a local job creator and believes he would have the resources to oust the incumbent, but Democrats have better opportunities elsewhere in this group, and in California. CA 39: On paper, California's 39th district should be an easy win for Democrats: it is an open seat in a racially diverse, suburban district that Hillary Clinton carried. However, Republican candidate Young Kim, who was born in Korea and formerly worked with outgoing GOP Rep. Ed Royce, has run a strong campaign and maintained connections with the district's sizeable Asian-American community. Meanwhile, Democrat Gil Cisneros came out of the primary with some bumps and bruises, though he is also a lottery winner who can dip into personal funds ahead of Election Day. FL 27: This race was originally a gift to Democrats, when popular Republican Rep. Ileana Ros-Lehtinen decided not to seek reelection in a Miami-area district, in which voters have split their tickets, voting for Democratic presidential candidates, for years. Republican nominee Maria Elvira Salazar, a local Spanish-language TV anchor, has appealed to many voters in this heavily Cuban district, resulting in a tougher fight than many Democrats anticipated here. Nonetheless, Democrats remain favored to flip this seat. NM 2: Democrats normally might not set their sights on a district this Republican, but they have a star candidate in 33-year-old Xochitl Torres-Small, who has distanced herself from the national party. She also has the benefit of running for an open seat, presenting Republican state Rep. Yvette Herrell with a formidable challenge. These middle-income and mostly white districts flip from Republican to Democrat in many of our model simulations. Hillary Clinton carried a few of them and came close in the rest (average vote share: 48 percent). Some districts include an urban component along with suburban or exurban stretches, which could help Democrats. Their most likely victories here come in open contests, of which there are four, rather than from ousting incumbents. If most of these stay red, it is a sign the Republicans could hang onto control. AZ 2: Rep. Martha McSally opted to run for the Senate instead of re-election in Arizona's 2nd Congressional District, which might have been a smart political move, given that Donald Trump carried the state but not her district. Republicans believed that Tucson Hispanic Chamber of Commerce President Lea Marquez Peterson had a personal appeal that could defy the trend in the district, but it is looking increasingly like that the Democratic candidate, former Rep. Ann Kirkpatrick, will be returning to the House instead. KY 6: The results of Democrat Amy McGrath's challenge to Republican Rep. Andy Barr could help answer a couple questions: will ancestral Democrats return to the party after years of voting for Republicans (at least for federal office)? Moreover, does national stardom translate into district-level success? These are a mix of geographically larger suburban and exurban districts with Republican incumbents (three open). They mostly stay Republican in our simulations, but they are still important keep an eye on, as some could flip to Democrats in a wave election. FL 15: This race came onto the battleground map late, which benefits Democrats, due to their fundraising advantage. While Republicans are defending dozens of seats across the country, spreading their resources, Democrat Kristen Carlson has been outspending Republican state Rep. Ross Spano in an open contest, while gubernatorial candidate Andrew Gillum motivates nonwhite and young voters across Florida. UT 4: Utah is a conservative state that is divided on the President. Mitt Romney will likely cruise to victory in the Senate, but in Utah's 4th district, Republican Rep. Mia Love is playing defense, due to a polarizing President and a credible Democratic challenger in Salt Lake County Mayor Ben McAdams. There are a handful of Democratic open seats that Republicans have a good shot of flipping, mitigating likely losses in some of the groups above. President Trump carried all but one of these districts, posting large margins in the Minnesota districts, boosting Republican House candidates' hopes. MN 1: Former Acting Assistant Secretary of Defense Dan Feehan has not had an easy time trying to hold the open seat in Minnesota's 1st district for Democrats. If he manages to win, Feehan will demonstrate the importance of individual candidate profiles, at least while President Trump is in the White House. MN 8: This Duluth-area district is one of Republicans' only takeover opportunities this year, though it's increasingly looking like a good one. Former St. Louis County Commissioner Pete Stauber has taken advantage of the open race in a district Trump carried handily, while former Democratic state Rep. Joe Radinovich struggles to break through.